An online master’s in organizational leadership is a practical degree applicable to many industries. Graduates gain expertise in taking initiative, cultivating effective teams, managing group dynamics, leading change in complex environments, and dealing with organizational challenges. What is a Master’s Degree in Organizational Leadership? What Can You Do With a Master’s Degree in Organizational Leadership? We selected these programs based on quality, curricula, faculty, rankings, awards, and reputation. Students should be aware that some schools provide a master of arts version of the degree. Founded in 1831, the University of Alabama is the oldest public college in the state. Today, the university offers more than 57 online graduate programs in subjects including business administration, education, and communication sciences. Regarding their three-credit capstone requirement, students can choose between a professional option and an academic option. The professional option involves completing a major project and submitting a capstone portfolio. Learners who choose the academic option must take an approved communication elective and pass a comprehensive final exam. UA accepts new master’s students year round. Applicants to the master’s in communication studies program must demonstrate a combined score of at least 300 on the verbal and quantitative sections of the GRE. Alternatively, they may score above the 50th percentile on the Miller Analogies Test. Prospective students also need a 3.0 GPA in the last 60 credits of undergraduate study. Distance learners enjoy access to many online student services. UA’s career center helps students search for jobs, change careers, and prepare for interviews. The writing center offers asynchronous writing help. UA is regionally accredited by the Southern Association of Colleges and Schools Commission on Colleges (SACSCOC). Founded in 1898 as a private research institution, Northeastern University is located in Boston, Massachusetts. The school offers more than 60 online programs, including over 30 web-based graduate options. To graduate, students must complete a capstone component in which they conduct field research to identify a problem facing a real organization. They then analyze the case, describe various solutions, and recommend a strategy for addressing the issue. Students can complete their MS in leadership curriculum online through asynchronous classes. They may enter the program in the fall, spring, summer, or winter terms, and most students finish the degree in 1.5-2 years. Learners interact with professors and classmates primarily through email and discussion boards. Applicants must submit a resume, two letters of recommendation, and unofficial undergraduate transcripts. They must also write a 500- to 1,000-word statement of purpose describing their educational goals. Northeastern is regionally accredited by the New England Association of Schools and Colleges (NEASC). George Washington University, a private research institution in Washington, D.C., offers dozens of distance programs from the associate to the doctoral levels. Students can take any combination of electives or pursue a concentration by choosing three courses in one area. Concentration options include leadership, learning, change, and globalization. Students may complete a leadership internship or independent research as part of their elective coursework. These courses can apply to a concentration track as long as the internship or project relates to the focus area. GW provides an array of resources to distance learners. Through the GW library, online students can schedule research consultations, read digital journals and articles, and order books. Academic Commons provides web tutoring sessions to all GW students. Additionally, online learners can take advantage of mental health counseling, career services, and the university writing center. Applicants must submit a resume, a statement of purpose, unofficial transcripts, and two letters of recommendation. Admitted students can begin the program in the fall or spring semesters. GW is regionally accredited by the Middle States Commission on Higher Education (MSCHE). Based in Lincoln, Illinois, the private Lincoln Christian University affiliates with the Christian churches and churches of Christ. The school offers seven web-based degrees, including a fully online master’s in organizational leadership. Additionally, students must complete a capstone project in organizational leadership. Through this project, learners reflect on their theological, personal, and professional growth. They summarize their thoughts in a 25- to 30-page report. Students can complete the entire master’s in organizational leadership online through asynchronous courses. Students take one course at a time in seven- and eight-week blocks. Online learners spend 15-18 hours per week on coursework, typically submitting assignments on Tuesdays, Thursdays, and Saturdays. Students generally earn this master’s degree in around 21 months. Applicants must submit an application along with an essay. They also need to provide two Christian character reference forms from a church leader or other person who can speak to the applicant’s Christian character. LCU is regionally accredited by the Higher Learning Commission (HLC). Founded in 1932, Clarks Summit University is a private, nonprofit institution based in Pennsylvania. CSU offers over 20 web-based academic options at the associate, bachelor’s, and master’s levels, including an online organizational leadership master’s degree. In addition, MA in organizational leadership students take 15 credits of electives in their concentration area. They take online courses in eight-week sessions beginning in January, March, May, August, and October. Students can complete the entire MA in organizational leadership online in two years, but they can take up to six years to finish the curriculum. CSU boasts many online resources for distance students. Online learners can access databases, academic journals, and other library resources online. They can improve their writing skills and ask for feedback on assignments through the online writing center. Applicants need at least a 3.0 GPA in their undergraduate studies to qualify, and admitted students can transfer in up to nine credits of graduate-level coursework. CSU offers discounts to master’s learners who work in ministry, serve in the military, or who graduated from a college accredited by the Association for Biblical Higher Education. CSU is regionally accredited by the Middle States Commission on Higher Education (MSCHE). Lewis University, a Catholic and Lasallian institution located near Chicago, boasts well over 100 undergraduate and graduate programs and serves 6,500 students. Students can choose from 19 fully online degrees, including 11 graduate options. The online MA in organizational leadership consists of 36 credits that students can complete entirely online through self-paced courses. Students take eight required courses that discuss leadership theory, conflict management, and psychology. They also complete a capstone class called leadership and the future. During the class, learners conduct a detailed business case analysis, draft a paper, and present their observations. The professional and executive coaching certificate prepares students to become independent or internal executive coaches. The program holds approval from the Center for Credentialing and Education, and students can apply their coursework toward board-certified coach certification. Applicants need work experience in a management role to qualify for admission. They should also hold a bachelor’s degree from a regionally accredited university and a 3.0 undergraduate GPA. Lewis admits students with lower grades on a provisional status. In addition, applicants must submit two letters of recommendation and an essay describing their personal and professional goals. Lewis is regionally accredited by the Higher Learning Commission (HLC). A public research university established in 1890, the University of Oklahoma enrolls more than 20,000 students. OU’s extended campus delivers the school’s 15 fully online programs, including a master’s degree in administrative leadership. In the final phase of the program, students select from three degree completion options. They may work on a master’s thesis, take six additional credits and a comprehensive exam, or enroll in the experiential leadership completion program. During the experiential leadership program, learners attend a one-week, on-campus residency; undertake a four-week personal leadership development project; and take a final exam. Students can complete the entire MA in administrative leadership online through asynchronous classes. Learners typically take two courses during the 16-week fall and spring semesters, along with one course during the eight-week summer term. Following this schedule, students can finish 15 credits per year and complete the curriculum in just over two years. OU is regionally accredited by the Higher Learning Commission (HLC). Brandman University, a private, nonprofit institution, educates working professionals at over 25 campus locations. The school offers more than 30 online master’s programs spanning subjects such as social work, business administration, and education. Students pursuing the online MA in organizational leadership take a total of 36 credits through 12 courses. They complete four organizational leadership theory courses that explore topics including ethics, systems, and democracy. Students then take three courses discussing the practical applications of leadership theory. Additionally, learners complete 12 graduate-level electives that they select in consultation with an academic adviser. At the end of the program, learners take a capstone course that integrates the theories and practical skills discussed throughout the program. Brandman administers the master’s in organizational leadership in online and hybrid formats. Full-time students often finish the program in just over one year. Applicants need to submit an application and meet one of four academic criteria to qualify for admission. Students with a 3.0 GPA in their last 30 credits of coursework qualify for admission. Applicants with a GPA between 2.5-2.99 in their last 30 credits must submit scores from an accepted exam such as the GRE, GMAT, or Miller Analogies Test. Alternatively, students can hold a master’s degree or compile a portfolio demonstrating their readiness for graduate work. Prospective students interested in emphasizing business studies might consider applying to Brandman’s online MBA in organizational leadership. Brandman is regionally accredited by the WASC Senior College and University Commission (WSCUC). Crown College, a private Christian institution founded in 1916, is located near Minneapolis, Minnesota. Crown offers over 20 web-based degrees at the undergraduate and graduate levels, including an online MA in organizational leadership. The master’s program in organizational leadership teaches students about leadership theory, skills, strategy, and philosophy from a Christian perspective. Students learn to approach challenges in the business and nonprofit sectors with an understanding of Christian ethics and principles. Crown administers the MA in organizational leadership entirely online through seven-week courses. Students can take one course at a time and finish the program in just two years. They may start the program in fall or spring semesters. Applicants to crown should hold a bachelor’s degree from a regionally accredited college or university, but Crown may consider applicants from non-accredited bachelor’s programs on a case-by-case basis. Prospective students should demonstrate a 2.5 GPA in all postsecondary academic work. Crown College is regionally accredited by the Higher Learning Commission (HLC). Colorado State University-Global Campus is a public, online-focused institution founded in 2007. Initially enrolling just 200 students, today CSU Global serves 18,000 online learners. The school boasts over 20 online graduate options, including an MS in organizational leadership. Learners can complete the entire master of science in organizational leadership online through asynchronous courses. Students take courses in accelerated, eight-week sessions and can begin the program any term. CSU Global offers every class every term. Applicants need at least a 3.0 GPA for full admission, but CSU Global admits students with lower grades on a provisional basis. Prospective students also need to submit a statement of purpose, a professional resume, and an online assessment. CSU Global also offers an accelerated organizational leadership path for executive-level professionals. In the program, students take expedited, six-week classes with a cohort. They take 10, three-credit classes, finishing the program in just over one year. Applicants to the accelerated program need a 3.25 GPA and at least five years of leadership experience. They must also submit a statement of intent and a letter of recommendation. CSU Global is regionally accredited by the Higher Learning Commission (HLC). Based in Denver, Colorado, Regis University is a private Jesuit institution dating back to 1877. The school educates over 11,000 students through five colleges. The Anderson College of Business offers online programs, including a master’s in organizational leadership. At the end of the program, students take a capstone course in strategic corporate social responsibility and stewardship. In this course, learners consider ways that businesses can leverage corporate social responsibility to enhance products, improve profits, and increase competition. Students take classes through accelerated, eight-week terms which begin in January, March, May, July, August, and October. Learners devote 10-20 hours to each course outside of class time. Applicants must submit an online application, official transcripts, a current resume, and an admission essay. Some students may need to sit for a faculty interview or submit GMAT or GRE scores. Prospective students must submit applications one month prior to their desired start date. Regis is regionally accredited by the Higher Learning Commission (HLC). Founded in Minnesota in 1858, Winona State University now enrolls close to 8,000 students in over 100 undergraduate and graduate programs, including an online MS in leadership education with an emphasis in organizational leadership. Learners also need to write a master’s thesis or a significant research paper. Whether they choose the thesis or non-thesis option, students need to pass a written comprehensive examination. WSU administers its organizational leadership master’s program through a blend of synchronous and asynchronous online coursework. Students complete most coursework independently and also participate in video conferencing sessions several times each semester. Synchronous sessions typically take place during the evening, and students know the schedule of video chat sessions well in advance. Students who take 2-3 courses each semester typically complete the degree in two years. WSU boasts many resources for online learners. Through the Warrior Hub, distance learners can live chat with university staff to learn about academic policies, student account services, academic deadlines, and graduation requirements. The Warrior Success Center provides online academic advising and career counseling. Additionally, through the library website students can access digital academic resources and contact librarians. WSU is regionally accredited by the Higher Learning Commission (HLC). The University of Denver is a private research institution established in 1864. DU’s University College, which delivers the school’s online and evening programs, boasts an MS in organizational leadership with five concentrations. Learners choose one of three capstone options at the end of the program. They may complete a capstone seminar, an interdisciplinary capstone seminar, or a capstone project. In the interdisciplinary capstone seminar, learners study alongside students from other graduate programs and write a 7,000- to 8,000-word final paper. Students who opt for the capstone produce a thesis-level project with the help of a faculty adviser. Graduate learners complete DU’s entire master’s in organizational leadership curriculum online. Students take classes through 10-week terms and complete the degree in as few as 18 months. DU delivers online classes in a fully asynchronous format through the Canvas learning platform. Students can complete most of their coursework independently, but they may also connect with their professors through Skype meetings, phone calls, in-person meetings, or instant chat. DU is regionally accredited by the Higher Learning Commission (HLC). Established in 1818, Saint Louis University is a private, Roman Catholic institution offering close to 90 undergraduate programs and more than 100 graduate degrees. The school delivers more than 40 undergraduate and graduate options online. Students pursuing the MA in leadership and organizational development take classes entirely online through eight-week terms. They complete coursework both asynchronously and synchronously in classes of no more than 20 students. Learners who take one course at a time earn their master’s degree in 2.5 years. Learners complete their final three credits through an applied research project comprising three, one-credit components. In the first component, students identify an organizational problem. During part two, learners develop a research strategy and a possible solution to the issue. In the final phase, students implement their solution, write a formal report, and reflect on their findings. For admission to the online master’s in organizational development and leadership, applicants must boast a 3.0 GPA, three years of work experience, and current employment. In their undergraduate studies, students must complete basic coursework in leadership or organizational theory, statistics or research methods, psychology, and business. SLU is regionally accredited by the Higher Learning Commission (HLC). Established in 1862, USD is a public research institution with more than 40 online programs. Students attending the school’s online MS in administration program can choose from seven focus areas, including human resources, health services administration, and organizational leadership. USD’s MS in administration in organizational leadership features a multidisciplinary curriculum that prepares students to lead in public service-focused organizations. Students learn about the administrative theory and practice applicable to government agencies, nonprofit organizations, healthcare facilities, and social service providers. The program also benefits students looking to work in for-profit enterprises that provide public services. USD’s online learners benefit from numerous web-based resources. The Academic and Career Planning Center helps students succeed academically and find jobs. The online writing center provides assistance with grammar, style, and organization. Distance learners can access full eBooks, databases, and articles through the library website. All online graduate students pay the same tuition rate regardless of whether they reside in state or out of state. USD is regionally accredited by the Higher Learning Commission (HLC). Fresno Pacific University, a private Christian institution, educates around 4,000 students in over 100 areas of study. FPU offers seven online graduate degrees, including an MA in leadership and organizational studies. FPU offers resources to distance learners to help them succeed academically and plan for the future. The Academic Success Center provides online resources to assist students with their writing, grammar, and style. Students can also access guides on time management and studying strategies. Through FPU’s career services center, learners can consult resources on searching for jobs, creating a resume or cover letter, and preparing for interviews. Applicants need at least a 3.0 GPA to qualify for admission. Prospective students with lower GPAs must submit a letter of petition, along with GRE, GMAT, or Miller Analogies Test results. Applicants must also send in a resume, a professional reference, and a statement of intent. FPU is regionally accredited by the WASC Senior College and University Commission (WSCUC). Founded in 1887, Gonzaga University is an institutional member of the Association of Jesuit Colleges and Universities. The school operates 10 distance education programs for graduate students, including an online master of arts in organizational leadership. Degree candidates train in advanced leadership practices centered on strategic, creative, and critical thinking. Graduates go on to occupy management roles in fields such as labor relations, healthcare administration, and corporate training. The 30-credit degree plan includes core classes in organizational behavior and theory, business communication, and leadership ethics. In lieu of open electives, students can pursue a concentration in either global leadership, change leadership, servant leadership, or strategic and organizational leadership. For example, learners who pick the global leadership concentration delve into conflict resolution in transnational and multicultural contexts. The curriculum culminates with a capstone seminar in which students reflect on their own leadership philosophy, applying accumulated skills in an individual development plan. 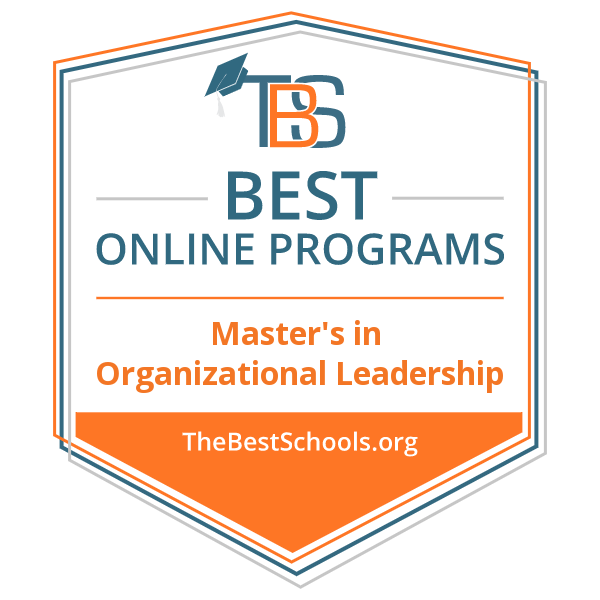 In addition to asynchronous coursework facilitated by Blackboard, the online master’s in organizational leadership program contains experiential learning components. Students complete one on-campus immersion and can choose to pursue additional immersive experiences throughout their time at Gonzaga. Learners may also partake in study abroad trips to locations like Columbia, Belgium, and Italy. These experiences enable learners to examine intercultural group dynamics, preparing for their participation in a changing global workplace. Applicants need at least a 3.0 GPA. The university does not require GRE or GMAT scores. All online students pay one affordable tuition rate. Most candidates earn their master’s in two years. Gonzaga is regionally accredited by the Northwest Commission on Colleges and Schools (NWCCS). Charter Oak State College was established in 1973 as a public liberal arts institution. Today, the school enrolls over 2,300 students and offers 15 degree options. The academic catalog includes an online master of science in organizational effectiveness and leadership. Through a 33-credit curriculum, students develop a personal leadership style, drawing from their worldview and professional experiences. The Charter Oak program also helps learners examine business interactions at the individual, group, and organizational levels, thereby strengthening their abilities to plan and implement projects. The degree plan offers courses like organizational development landscape, intercultural and global perspectives, and group process and team dynamics. Students take advanced classes in either a business or nonprofit concentration. The former option trains students in strategic communication and financial planning. The latter track emphasizes fundraising and a nonprofit organization’s ability to induce social change. Regardless of their concentration, students complete applied research projects. They integrate quantitative and qualitative analysis skills to develop research questions, identify limitations and design, and conduct work-based investigations. The research project leads into the capstone requirement, which tasks students with relating their accumulated knowledge and skills to organizational effectiveness within their current or future work environments. To pursue this master of science in organizational leadership, online candidates must hold a bachelor’s degree earned with a minimum 3.0 GPA. They also need to display, through resume or CV, at least three years of work experience, with preference given to applicants who possess five or more years. Online students pay tuition based on residency status. The college provides endowed scholarships and need-based grants. Charter Oak is regionally accredited by the New England Commission of Higher Education (NECHE). Powered by Canvas, Azusa Pacific University operates over 25 remote certificate, degree, and professional credentialing programs. The selection comprises an online master of arts in leadership that focuses on competency-based learning. Through an interdisciplinary curriculum, students cultivate communication, strategic decision-making, and team-building skills that prepare them for careers as holistic leaders. Learners may earn their credentials entirely online. Alternatively, they can pursue a hybrid learning experience by taking accelerated eight-week classes on campus. The 36-credit degree plan divides into core topics, classes in the emphasis area, and open electives. Students take perfunctory coursework like leadership theory foundations and organizational behavior. They pursue three advanced classes in either a sports management, leadership development, or executive leadership concentration. The remaining credits funnel into self-elected courses, with the option for a community service practicum. APU’s master’s in organizational leadership online program emphasizes research methods and design. Students apply action research methodology to their own professional contexts, developing questions, collecting data, and presenting their findings. Degree candidates round out their graduate training with a capstone project, formulating individual leadership philosophies and plans for intellectual and career growth. Applicants need a bachelor’s degree and a minimum 3.0 GPA. Candidates whose GPA falls below this threshold can apply for conditional admission. However, they must furnish proof of academic competency through professional certification, completed graduate-level coursework, or adequate standardized test scores. All distance learners benefit from affordable per-credit tuition rates. APU is regionally accredited by the Western Association of Schools and Colleges (WASC). Based in Bourbonnais, IL, Olivet Nazarene University delivers 10 remote business certificates and degrees, including an online master of organizational leadership. Powered by Blackboard, the ONU program offers flexible classes that start every eight weeks. Students develop the teamwork and strategic communication skills to strengthen organizational development in government agencies and private companies. Distance learners generally earn their graduate credentials in under two years. Recognized by U.S. News & World Report for its academic excellence, the online master’s in organizational leadership program totals 36 credits. Students take classes like financial environments of organizations; coaching, mentoring, and resolving conflicts; and power politics and leadership. They also learn how to create performance metrics and execute project strategies with respect to organizational goals and timelines. The degree contains an optional global immersion trip that spans 8-10 days. Here, students explore a different culture and learn how other countries conduct business. Distance learners apply accumulated skills in a special topics capstone project. With the guidance of a faculty mentor, students either propose a business plan, create a research project, or publish a scholarly article that attempts to solve an identified leadership challenge. Candidates submit an online application, a professional resume, and academic transcripts. Prospective students must possess a bachelor’s degree earned with at least a 2.5 GPA. On top of affordable tuition prices that ignore residency status, students reduce degree costs by earning up to 82 transfer credits through prior learning assessment. ONU is regionally accredited by the Higher Learning Commission (HLC). Founded in 1997, Western Governors University enrolls more than 91,400 students every year. The institution delivers 14 remote business programs, including an online master of science in management and leadership. Through a comprehensive curriculum, students learn to drive organizational initiatives and manage effective interdisciplinary teams. Distance learners go on to occupy high-paying roles in nonprofit organizations, government agencies, and healthcare facilities. According to an internal survey, more than 94% of employers reported that WGU graduates perform far beyond expectations. The 34-credit degree plan consists of classes like managing human capital, ethical leadership, and data-driven decision-making. Students also delve into change management and innovation, learning how to navigate opportunities and challenges facing small businesses and multinational corporations. Learners round out their training with an immersive capstone experience. Working with a real-world organization, students apply research and management skills to improve company efficiency. The WGU program operates a competency-based degree model. Students can pace their coursework according to their own schedules and complete a class as soon as they demonstrate mastery of key concepts and skills. This structure enables students with existing leadership skills and job experience to accelerate their training, earning a master’s in as few as nine months. WGU does not require GPA minimums or GRE/GMAT scores. However, candidates must possess a regionally accredited bachelor’s degree and at least three years of full-time work experience. Online students benefit from an affordable term-based tuition price. WGU is regionally accredited by the Northwest Commission on Colleges and Universities (NWCCU). The online master’s in organizational leadership program receives programmatic accreditation from the Accreditation Council for Business Schools and Programs (ACBSP). Located in Omaha, NE, Creighton University operates 18 remote graduate programs. The selection includes an online master of science in organizational leadership facilitated through the Department of Interdisciplinary Studies. The Creighton program helps students identify and surmount organizational challenges, thereby engendering positive change in their workplaces and communities. Learners complete all required coursework online through asynchronous courses powered by Blackboard. The 36-credit degree plan evenly divides into core classes and electives. Students take required coursework like approaches to human capital; communicating and leading across cultures; and leadership theory, application, and reflection. They also develop academic and business writing skills. Students can apply their 18 elective credits toward either a business leadership or healthcare leadership concentration. Alternatively, learners can use the electives to earn one of four graduate certificates. Options include healthcare ethics, healthcare management, lifestyle medicine, and negotiation and conflict. Students who choose the lifestyle medicine certification focus their training on cultivating healthy and sustainable lifestyles through behavior modification. They also learn to manage sleep, diet, and exercise, preparing for careers as nutritionists, community health educators, and athletic trainers. Furthermore, Creighton offers dual degree paths, allowing students to earn an MBA on top of their online organizational leadership master’s degree. Admission requirements consist of a bachelor’s degree earned with a minimum 3.0 GPA. Through a resume or CV, candidates must display at least two years of full-time leadership or work experience. Additional documents include a personal statement and two recommendation letters. The university charges tuition based on enrollment status. Creighton is regionally accredited by the Higher Learning Commission (HLC). Central Michigan University’s Global Campus offers more than 30 remote degree and certificate programs, including an online master of science in administration: leadership. This flexible program enables students to personalize the curriculum according to their professional interests and goals. Distance learners train to leverage fiscal management and strategic planning skills so that they can lead effective teams and fulfill organizational objectives. Degree candidates may earn their credentials online through asynchronous courses facilitated by Blackboard Learn. Alternatively, they can engage in hybrid learning by incorporating classes at the Mount Pleasant campus. The degree plan includes 33-39 credits, and classes consist of the required core, an elective component, and cognate topics. Students take such perfunctory courses as financial analysis, planning, and control; organizational dynamics and human behavior; and administration, globalization, and multiculturalism. Distance learners round out their academic training with an applied research project and portfolio presentation. CMU students who earn their master’s in organizational leadership online craft specializations from diverse elective options. They can prepare for careers in community advocacy by taking classes like labor relations issues and collective bargaining. Degree candidates may train to become business analysts with courses such as organizational psychology and workforce improvement strategies. Program candidates need a baccalaureate degree earned with a minimum 2.7 GPA. They must also fulfill competency requirements by completing prerequisite coursework in statistics and financial accounting. The university supports online students with an affordable per-credit tuition rate and financial aid. Opportunities include the Global Campus Endowed Scholarship and the U.S. Armed Forces Award. CMU is regionally accredited by the Higher Learning Commission (HLC). Based in Virginia Beach, VA, Regent University delivers over 132 undergraduate and graduate programs for distance learners. The catalog includes an online master of science in organizational leadership that totals 33 credits. The Regent option boasts recognition from U.S. News & World Report, which ranks it as the third-best online business program in Virginia. In addition to foundational business theories and practical management skills, students learn to affect social change and public policy within their communities. The online master’s in organizational leadership program structures coursework based on a student’s concentration. Students choose from 10 options, including global business leadership and communication, small business technology management, healthcare management, and organizational development consulting. They can also pursue a leadership coaching and mentoring concentration, preparing for careers in corporate training, motivational speaking, and executive team building. Regent operates eight start times each year. Students can choose a conventional online track, graduating in two years. Alternatively, degree candidates may enroll in the intensive fast-track option and earn their credentials in about 12 months. Distance learners pay one affordable tuition rate regardless of where they reside. The school offers need-based grants and endowed scholarships. To qualify for the latter awards, applicants generally need a minimum 3.73 GPA and GRE scores above the 50th percentile. Candidates submit official baccalaureate transcripts and a current resume. The university operates a holistic evaluation process that considers an applicant’s leadership experience, academic accomplishments, and writing acumen. Prospective students should also demonstrate clear personal ethics and professional goals. Regent is regionally accredited by the Southern Association of Colleges and Schools Commission on Colleges (SACSCOC). Eastern Mennonite University offers eight distance education programs, including an online master of arts in organizational leadership. The EMU option targets mid-career business professionals who want to develop advanced management, communication, and conflict transformation techniques to strengthen complex organizations. Distance learners take classes year round, with options of asynchronous courses powered by Moodle and flexible evening classes on the Harrisonburg, VA campus. Students typically complete the program in two years by taking two courses at a time. The 35-credit degree plan includes classes like organizational behavior, transformative leadership in dynamic contexts, and project management/grant writing. Students also delve into managerial finance and budgeting. Additionally, distance learners engage in a mentorship program, pairing with professionals in their business community to discuss pertinent leadership challenges. The experience culminates in a project and presentation. EMU students who pursue their master’s in organizational leadership online complete an Appalachian cross-cultural experience. During this eight-day residency, candidates apply accumulated learning to strengthen their roles as effective leaders and ethical global citizens. In addition to organizational effectiveness, learners examine how business decisions affect local, national, and international communities. Applicants need a bachelor’s degree earned with a minimum 2.5 GPA. EMU also requires at least two years of work experience that demonstrates substantial leadership and team building. Additional requirements include two reference letters and a personal interview with the program director. Prospective students do not need to submit GRE or GMAT scores. The university accepts transfer credit on a case by case basis. EMU maintains regional accreditation from the Southern Association of Colleges and Schools Commission on Colleges (SACSCOC). Located in St. Davids, PA, Eastern University provides seven remote programs for business students. The academic catalog includes an online master of arts in organizational leadership that spans 20 months. Through a hybrid curriculum that combines asynchronous classes and residencies in Central City Philadelphia, students strengthen their critical thinking and strategic leadership skills. Eastern enrolls new students every August. Totaling 30 credits, the degree plan comprises courses such as practical financial management, fundraising for nonprofit organizations, and human resource and performance assessment. As one of their electives, students can participate in a study trip to Africa. While abroad, students learn about how culture affects business transactions and social exchange systems. They also develop cross-cultural communication skills. In lieu of a generalist track, the online master’s in organizational leadership enables students to pursue a concentration. Options include social enterprise, advocacy/public policy, and thesis/project. Learners who choose the third concentration work with a faculty adviser to complete written thesis research that answers a theoretical question. Alternatively, these students can implement a business plan, feasibility study, or program evaluation. To apply, candidates need an accredited bachelor’s degree. Prospective students must also possess a minimum 3.0 GPA and three or more years of leadership experience. Applicants with GPAs between 2.5-2.99 may apply for conditional enrollment. Additional admission materials include a personal essay, an academic writing sample, a resume or CV, and one recommendation letter. All online students benefit from affordable tuition rates and financial aid opportunities, including alumni scholarships and merit-based grants. Eastern is regionally accredited by the Middle States Commission on Higher Education (MSCHE). Founded in 1903, the Milwaukee School of Engineering is a private higher education institution that enrolls over 2,800 students annually. The academic catalog consists of 16 undergraduate and 11 graduate degrees, including an online master of science in engineering management with emphasis in organizational leadership. The MSOE program trains students in technology-oriented management skills, enabling them to control major aspects of the supply chain and facilitate continuous improvement of products, services, and employee performance. Distance learners typically earn their credentials in 2-5 years, depending on how many courses they take each term and in what format. Students can complete the entire online master’s in organizational leadership program through Blackboard-powered asynchronous classes. Learners may also take blended classes in which they meet face to face with peers and instructors for three hours every other week. This hybrid learning structure synthesizes the flexibility of online learning with the rich collaboration of traditional academics. The degree plan totals 45 credits and includes required classes like statistical applications, operations and systems management, and marketing management. Students also take three research and writing modules, learning how to craft academic papers and conduct research with respect to industry standards. Distance learners use five electives to pursue personal interests or craft an organizational leadership concentration. The program culminates in either a written thesis or capstone project. MSOE requires applicants to hold bachelor’s degrees earned with a minimum 2.8 GPA. Candidates whose GPAs fall below this threshold must submit adequate GMAT or GRE scores. The university prefers students with three years of full-time work experience. MSOE maintains regional accreditation from the Higher Learning Commission (HLC). Based in Mechanicsburg, PA, Messiah College delivers 10 graduate degrees, including an online master of arts in higher education-strategic leadership. This 36-credit program trains students to analyze and strengthen the character-base elements of leadership. The Messiah option focuses on ethical decision-making and self-reflection as a means to bolster organizational effectiveness and contribute to the social good. Students engage in a hybrid learning method that combines Canvas-powered asynchronous classes with intensive summer courses on campus. The curriculum includes core classes in institutional assessment and effectiveness, organizational culture and governance, and equity issues in higher education. In the strategic leadership concentration, students take courses such as advanced planning, creative thinking, and organizational change. Additionally, candidates complete a guided 120-hour internship that aligns with their academic and professional goals. Learners fill out the remaining credits with electives. Like other online master’s in organizational leadership programs, the Messiah degree culminates with a capstone experience. Students identify a higher education challenge and, applying advanced research methodologies, develop actionable recommendations that they present in written and oral forms. This comprehensive training prepares graduates for roles as college registrars, recruitment directors, and deans of students. Candidates need a bachelor’s degree earned with a minimum 3.0 GPA. In addition to academic transcripts, application materials include a professional resume, a statement of purpose, and one recommendation from a higher education professional. The college offers one low tuition rate to all online students. Learners also benefit from financial support, which includes program discounts, grants, and paid fellowships. Messiah is regionally accredited by the Middle States Commission on Higher Education (MSCHE). Located in Pittsburgh, PA, Duquesne University offers 15 remote graduate programs. The selection includes an online master of science in leadership that suits working professionals seeking to strengthen an individual management style and fulfill career advancement goals. With three yearly start dates and self-paced coursework powered by Blackboard, students can enroll in and progress through the Duquesne program at their convenience. The 30-credit curriculum evenly divides into required coursework and electives. Students take perfunctory classes like organizational communication, conflict resolution, and leading people. They work with an academic adviser to pick electives that align with their professional objectives. For example, degree candidates can pursue training in gender and leadership, examining the history of and contemporary challenges to gendered inequalities in the workplace. Duquesne allows students to transfer up to two electives from another accredited institution. The online organizational leadership master’s degree requires students to complete a capstone project. Through an integrated simulation, learners apply key competencies and concepts to solve a pertinent business challenge. Afterwards, they reflect on their experience in writing, connecting what they learned throughout the program to their professional lives. The university requires GRE scores but not GPA minimums. Application materials include official academic transcripts, a 500-word personal essay, and a current CV or resume. Candidates also need to schedule an admissions interview. Due to the school’s accreditation framework, Massachusetts residents cannot enroll in this online program. Duquesne is regionally accredited by the Middle States Commission on Higher Education (MSCHE). Through the Townsend Institute for Leadership and Counseling, Concordia University - Irvine delivers three certificate and five degree programs. The academic catalog includes an online master of arts in organizational leadership. The innovative curriculum helps students develop task-based skills, including the ability to execute complex systems and align project strategy to organizational values and mission. The CUI program also emphasizes strategic communication and leadership, enabling professionals to make difficult decisions while maintaining positive relationships among team members and executives. The online master’s in organizational leadership program kicks off with a four-day conference. This inaugural experience allows students to connect with peers and engage in hands-on training that draws on their personal and professional experiences. The 33-credit degree contains core classes like leading change and motivation; building healthy culture and performance; and leadership styles, neuroscience, and emotional intelligence. Students also learn to manage difficult people and resolve conflict through an eight-step process. Students round out their graduate education with a capstone seminar. Under the guidance of faculty advisers, learners conduct research or write a scholarly article. They present completed works at the institute’s annual conference. By taking two, seven-week classes at a time, students can earn their credentials in one year. CUI operates fall and spring entry dates. Admission criteria include an accredited bachelor’s degree earned with a minimum 3.0 GPA. Candidates submit academic transcripts, an up-to-date resume, and at least one professional reference. They also need to send in a 500-word statement of purpose. CUI is regionally accredited by the Western Association of Schools and Colleges (WASC). Saint Joseph’s University is based in Philadelphia and enrolls more than 8,000 students annually. The school offers 19 remote graduate certificates and degrees, including an online master of science in organization development and leadership. The SJU program trains students to influence organizational culture and implement dialogical models that motivate interdisciplinary teams. Degree candidates also learn to assess their own development as business professionals through best practices that integrate situational leadership skills and whole brain theory. The online master’s in organizational development and leadership program enables students to earn their credentials entirely through asynchronous courses powered by Blackboard Learn. Candidates may also create a hybrid learning experience by taking flexible classes on campus. Students complete a 36-credit degree plan based on their concentration. Options include adult learning and training, organizational dynamics and leadership, organizational psychology and development, and organizational leadership. For example, students who pursue organizational dynamics and leadership take three foundation classes in intervention skills, facilitating organizational development, and strategic leadership. They fill out the remaining curriculum with guided electives. Learners in this concentration can focus their graduate training on health administration by taking electives like managed healthcare, practitioner ethics, and health services research. Application materials include official academic statements, a personal statement, two recommendation letters, and a professional resume. SJU prefers candidates with 2-8 years of relevant work experience. The university does not ask for standardized test scores. Full-time students take three courses each semester and graduate in two years. SJU is regionally accredited by the Middle States Commission on Higher Education (MSCHE). The University of Kansas delivers 23 remote graduate programs. This catalog includes an online master of science in business and organizational leadership. Through a comprehensive curriculum, students learn the central tenets of leading individuals and companies, including skills such as team building, talent management, and strategic change and direction. KU graduates go on to occupy high-ranking positions as human resource managers, corporate coaches, and training and development directors. Degree candidates take 30 credits of coursework in topics like applied statistics, ethical decision-making in business, and developing effective management and team skills. The curriculum contains two electives, which students use to take on advanced leadership topics or complete an internship. Graduate training culminates with a capstone project where learners synthesize accumulated knowledge to research and present findings on complex challenges facing organizations. The online master’s in organizational leadership program operates a hybrid learning structure. Students take 12 classes at the Lawrence campus and 12 remotely through Blackboard. The College of Business allows candidates to transfer up to six credits toward degree completion. This policy means that distance learners with prior learning and work experience can earn their credentials in as few as 10 months. Furthermore, KU enables students to apply completed organizational leadership coursework toward an online MBA. They can pursue this second degree at their own pace. Applicants submit official academic transcripts and a professional resume/CV. Prospective learners must possess at least eight years of leadership and managerial experience. Relatedly, MS students with a minimum 3.5 GPA can apply for a GMAT waiver when seeking enrollment in the online MBA program. KU is regionally accredited by the Higher Learning Commission (HLC). The College of Business holds specialized accreditation from the Association to Advance Collegiate Schools of Business (AACSB). The University of Wisconsin Stevens Point is part of a 26-campus system and offers 100 programs. UWSP oversees a catalog of online degrees that includes a 30-credit MS in community and organizational leadership. This degree focuses on the skills needed for community development, cultivating critical thinking, program planning, and grant writing competencies. Learners in the master’s in organizational leadership online program study organization and program management, best practices in program development, and project planning and evaluation. A course in grant funding trains learners about the grant writing techniques used by professionals to secure funding from various sources. As a culminating experience, students complete a research proposal, develop a thesis, and orally defend their work. Alternately, students may complete a culminating project that addresses the needs of a community or take a comprehensive exam that tests their cumulative knowledge. Students can graduate in as few as 18 months, although most participants earn their MS in community and organizational leadership in 2-3 years by studying on a part-time basis. Online students all pay the same tuition rate, regardless of their state of residency. Admission requires a minimum 2.75 GPA. The University of Wisconsin Stevens Point is regionally accredited by the Higher Learning Commission (HLC). Trevecca Nazarene University offers programs that blend faith with the liberal arts. Trevecca Online provides students with many distance learning opportunities, including its 33-credit master of organizational leadership, which focuses on three levels of leadership: personal leadership development, interpersonal and group leadership, and organizational impact. Students develop proficiencies in strategic thinking and organizational leadership while learning to cultivate networks and raise funds. A notable course develops students’ abilities to analyze and solve problems using a servant-leadership model that emphasizes helping others while maintaining an organization’s values. This online master’s in organizational leadership examines conflict resolution between supervisors and subordinates using simulations and role playing. Faculty deliver the program using six-week courses. Students can complete this asynchronous master of science in organizational leadership online in 18 months. Distance learners pay the same tuition rate, regardless of residency. A military-friendly school, Trevecca offers military personnel scholarships equal to 10% of tuition and awards college credit for military training. In addition to comprehensive financial aid options, learners can use payment plans to better manage tuition and fees. Admission requires a minimum 2.5 GPA. Trevecca Nazarene University is regionally accredited by the Southern Association of Colleges and Schools (SACS). Norwich University has served learners in Vermont for more than 200 years. The nation’s oldest private military school was among the first to use experiential learning in a postsecondary setting. U.S. News & World Report recognizes Norwich University as one of the top 100 regional universities in the North. Norwich Online builds upon the school’s pioneering legacy with programs that students can complete from a distance. One such offering is the school’s MS in leadership with a specialization in organizational leadership. Some concentrations require a capstone, in which students apply learned concepts and principles to solve an organizational challenge. Capstone experiences also require students to complete a 1,500-word paper fit to publish in a professional journal. The program also requires a one-week residency in Vermont, which serves as a culminating experience. Graduates build leadership development portfolios related to their professional goals. Distance students pay the same tuition, regardless of residency. Admission generally requires a minimum 2.75 GPA; applicants with lower GPAs may still be admitted, but these students must also submit GRE or GMAT scores. Norwich University is regionally accredited by the New England Association of Schools and Colleges (NEASC). Learners use elective credits to pursue personal interests, such as career development in organizations and strategies to facilitate adult learning. Learners also have the option to complete a five-course, fully online graduate certificate in human resource development. Students who complete this certificate finish almost half of the requirements for the MS in adult organizational learning and leadership. Students pursuing this master’s in organizational leadership online can undertake optional internships to acquire hands-on experience. Participants also complete a three-credit exam or project or opt for a 12-credit thesis as their culminating experience. Online learners pay the same tuition, regardless of residency status. Admission requires a minimum 3.0 GPA. The program admits students in the fall, spring, and summer. Established in 1943, Southwestern Assemblies of God University provides students with learning that embraces their faith. The online MA in organizational leadership enrolls students interested in entering traditional business environments as well as learners planning to provide professional and educational services within missions and church ministry organizations. The program emphasizes Christian leadership principles, ethics, and decision-making skills. Students in this 36-credit program learn about spiritual formation; leadership in management; high-impact team leadership; and strategic thinking, planning, and organizational change. Graduates can communicate effectively, motivate others, solve problems, and act as change agents within organizations. SAGU limits its class sizes to facilitate one-on-one interactions with faculty. Online learners receive access to many campus resources, such as counseling services, the school’s wellness center, and job training assistance. All distance students pay the same tuition, regardless of their state of residency. The online organizational leadership and management master’s degree enrolls new participants each spring, and students must complete the courses on rotation as scheduled. Admission requires a minimum 2.5 GPA. Southwestern Assemblies of God University is regionally accredited by the Southern Association of Colleges and Schools (SACS). A Catholic school founded in 1924, Misericordia University educates about 2,800 students online and at its residential campus in Dallas, Pennsylvania. For more than 90 years the school has helped nontraditional learners complete degrees on a full-time or part-time basis. Misericordia University continues to serve working professionals through a variety of online and hybrid degrees. The school’s MS in organizational management offers specializations in management, healthcare management, sports management, and human resource management. All students complete a 24-credit core that examines topics such as financial management, organizational behavior, and strategic management. One course uses case studies to delve into the legal aspects of administration and the scope of administrative authority, while another introduces students to the principles and techniques used to investigate research challenges related to organizational behavior and management. Students use 12 credits to focus on their specialization. Learners can complete their online master’s in organizational leadership in 30 months on a part-time basis. Distance students all pay one tuition rate, regardless of their state of residency. Admission typically requires a minimum 3.0 GPA, although students with lower GPAs may receive conditional admission. The program enrolls new learners in the fall, spring, and summer. Misericordia University is regionally accredited by the Middle States Commission on Higher Education (MSCHE). Additionally, the school’s online MS in organizational management program is accredited by the International Assembly for Collegiate Business Education (IACBE). Buena Vista University, affiliated with the Presbyterian Church, enrolls students on a residential campus in Storm Lake, Iowa; at more than a dozen other sites across the state; and online. With fewer than 2,000 students, BVU provides learners with comprehensive academic opportunities in classrooms that feature a 9-to-1 student-to-faculty ratio. Students begin the school’s 30-credit MA in organizational leadership track with a course that introduces them to the essentials of graduate study. Learners can complete this fully online degree in 18 months. Major courses cover subjects like the history and theory of leadership studies, leading across boundaries, leadership in a social context, and leading with a systems thinking mindset. Students finish the online master’s in organizational leadership program with an executive leadership internship or a research consulting project. Undergraduates enrolled in onsite or online degree completion programs can enroll in a “bachelor’s plus one” option; this allows them to complete this master’s degree in one additional year, after earning their bachelor’s diploma. Online students can access one-on-one online tutoring through Smarthinking. The school also offers a comprehensive suite of financial aid options, including scholarships. An early admission option allows BVU learners to transfer up to 12 credits toward this degree; early admission requires a minimum 3.0 GPA and standing as a senior at BVU. Regular admission requires a minimum 2.75 GPA. This program enrolls students six terms per year. Buena Vista University is regionally accredited by the Higher Learning Commission (HLC). The University of Colorado Boulder is affiliated with three U.S. Supreme Court justices, nine MacArthur fellows, and many Fulbright fellows. The school enrolls 34,000 students and offers 150 fields of study, including a robust business program for nontraditional learners. The school’s fully online, 30-credit MS in organizational leadership offers five tracks, including human resources, strategic leadership, and organizational communication. The program’s cohort model allows learners to build a strong peer network. The degree blends principles in business studies, social sciences, and communication to give learners a well-rounded education. All students complete a leadership core that covers topics like leading change and innovation, strategic communication, and performance management. Learners pursuing this master of science in organizational leadership online prepare to advance a company’s innovation initiatives in areas such as distribution and management. All students complete a capstone business research project using real business data. The school’s Professional Skills Mastery Lab (ProLab) allows learners to supplement classroom learning with hands-on professional development by engaging in mentorship opportunities and workshops. Part-time learners can graduate in just 19 months. Applicants need to hold a minimum 2.75 undergraduate GPA. The University of Colorado Boulder is regionally accredited by the Higher Learning Commission (HLC). One of the nation’s oldest institutions of higher education, Mercer University provides an intimate learning community with comprehensive degrees rooted in the liberal arts. The school enrolls about 8,500 students on three campuses in Georgia, at regional academic centers, and online. U.S. News & World Report ranks Mercer among the nation’s top national research colleges. All learners also undertake a research project that highlights their ability to use data to solve problems and challenges related to organizational leadership. The school partners with many major companies and local organizations, including AT&T, GEICO, and the Georgia Department of Corrections. Distance students pay the same tuition, regardless of residency. The program enrolls learners in January and August. Admission requires a minimum 2.75 undergraduate GPA and GRE or MAT scores. Mercer University is regionally accredited by the Southern Association of Colleges and Schools (SACS). A Catholic school in Nebraska for women, the College of Saint Mary enrolls 1,100 students who study in classrooms with an 11-to-1 student-to-faculty ratio. Learners can complete the school’s 30-credit MS in organizational leadership degree track in one year. This program accommodates working professionals by offering a fully online curriculum delivered through eight-week courses. The curriculum teaches learners how to build human capacity, cultivate team leadership that spans boundaries, leverage organizational behavior, and make effective financial decisions. Students participate in role-playing activities and strategy development to advance their mediation and negotiation skills. Graduates leave the online master’s in organizational leadership program with strong strategic thinking, communication, and leadership skills. The program helps its learners obtain leadership positions in the workplace and find better outcomes in male-dominated fields. While tuition continues to rise at many colleges, CSM recently lowered tuition by 33% and eliminated fees. Admission requires a minimum 3.0 GPA and at least three years of professional work experience. The program enrolls students in the fall. The College of Saint Mary is regionally accredited by the Higher Learning Commission (HLC). Concordia University Wisconsin is in the Lutheran Church-Missouri Synod and enrolls 8,000 students in 70 majors. Learners study on a 200-acre campus on Lake Michigan, at several educational centers across the state, and online. CUW offers a portfolio of fully online graduate programs, including an MS in organizational leadership and administration. This 32-credit degree focuses on leadership theory and practice, organization building exercises, and ethical leadership. Students learn how to lead change in organizations and select and implement information systems. A notable course related to the ethical dimensions of leadership teaches learners to incorporate Christian ethics into organizations. Additionally, during a practicum, students assess their leadership style and develop a personalized plan to harness their leadership abilities. Graduates bolster their emotional intelligence, transformational leadership skills, and Christian ethics. All learners pair up with an online student success adviser who guides them through every stage of their education at CUW. Students can also access online tutoring services. Distance learners can earn their degree in one year and pay the same tuition, regardless of residency. CUW also manages strong scholarship programs that exclusively target nontraditional learners. Concordia University Wisconsin is regionally accredited by the Higher Learning Commission (HLC). Mercyhurst University is a Catholic school located in Erie, Pennsylvania. The university enrolls 3,400 students on two campuses and online. Students learn in classrooms with a 13-to-1 student-to-faculty ratio. The school’s 33-credit online MS in organizational leadership emphasizes entrepreneurship, team building, and methods to empower others to meet organizational needs. Faculty use case studies and interactive exercises to develop leaders capable of motivating others to achieve results and drive organizational performance. The curriculum includes courses in leadership theory and practice, innovation and entrepreneurship, organizational ethics, and strategic management and planning. Students customize their online degree by selecting a concentration, such as accounting, sports leadership, or higher education administration. As a culminating experience, learners complete a research project or master’s thesis. The school’s portfolio of 4+1 degrees -- including the MS in organizational leadership -- allows participants to complete their bachelor’s and master’s degrees in just five years. As part of this program, undergraduates can take up to five graduate courses during their junior and senior years at no additional cost. All students pay the same tuition, regardless of their state of residency. Admission requires a minimum 3.0 GPA. Mercyhurst University is regionally accredited by the Middle States Commission on Higher Education (MSCHE). Founded in 1866, the University of Wisconsin Platteville enrolls learners on three campuses and online. The school offers students small classes and hands-on learning opportunities. U.S. News & World Report consistently ranks UW-Platteville’s online graduate business programs among the nation’s best. The school’s MS in organizational change leadership provides a fully online degree that learners can complete in two years. This 30-39-credit degree requires core coursework in organizational behavior, business analytics, and strategic thinking and change. A notable course on intercultural change leadership equips learners with the skills and techniques needed to address cultural differences in complex work environments. Students tailor their degree to match their professional interests by using at least six elective credits to pursue an emphasis in healthcare, project management, safety risk control, or human resources. Students can apply their newfound knowledge to address a topic or case study during a capstone experience. Alternately, learners may choose to complete an advanced research paper or research thesis as their culminating project. Participants can transfer up to 12 eligible credits into this online master’s in organizational leadership program. Learners may also earn credit based on professional certifications, such as the Professional in Human Resource or Senior Professional in Human Resource certificates. Students who complete an organizational leadership certificate at the University of California, Irvine or the University of California, Riverside can accelerate completion of the MS in organizational change leadership at UW-Platteville. Admission into this program requires a minimum 2.75 GPA. The University of Wisconsin Platteville is regionally accredited by the Higher Learning Commission (HLC). A small college in central Pennsylvania, Juniata College enrolls learners from around the world. U.S. News & World Report recently ranked Juniata College among the best national liberal arts colleges and best value schools. Since the 1970s, the school has received recognition for its curriculum, which emphasizes peace and conflict studies. Juniata’s online master of organizational leadership cultivates leaders in nonprofit, private, and public organizations. The 30-credit degree emphasizes social entrepreneurship, conflict and change, and collaborative partnerships. The interdisciplinary curriculum examines concepts and techniques in 21st-century leadership, organizational change, conflict and change, and strategic human resource management and people analytics. Students choose a capstone or master’s paper to finish their degree plan. The school manages a portfolio of peace internships for students or graduates with organizations in New York, Washington, D.C., and California. Students may also participate in internships abroad with organizations like the The Coalition for the International Criminal Court in the Netherlands. Recent graduates have found employment at leading corporations, nonprofit agencies, and government organizations. Many alums remain active with the school by providing one-on-one mentorship to current students and serving as guest lecturers. Juniata College is regionally accredited by the Middle States Commission on Higher Education (MSCHE). Lindenwood University -- affiliated with the Presbyterian Church -- provides comprehensive educational opportunities online and on campuses in Missouri and Illinois. The school enrolls 16,000 students in 130 programs, including 31 online degree tracks. The 36-51-credit MA in leadership features a core that covers subjects like the fundamentals of financial management, management practices, leadership theory, and strategic human resource management. This online master’s in organizational leadership uses a course on employment and labor law to examine topical issues in human resource management, such as mandatory benefits, wage and hours issues, and safety and workers compensation. Students also use six elective credits to pursue specialized training in areas such as operations management and employee training and development. A culminating course examines contemporary issues in leadership where students apply their knowledge to address challenges within an organization. Graduates of Lindenwood’s online master’s in organizational leadership program can go on to work in training and development and human resource management. Online learners pay the same tuition, regardless of their state of residency. Admission requires a minimum 3.0 GPA. Applicants without an undergraduate business degree should have taken foundational courses in business, economics, and accounting. Lindenwood University is regionally accredited by the Higher Learning Commission (HLC). A private Christian school in Chicago, Illinois, North Park University enrolls 3,000 students. Degree seekers learn in classrooms with a 12-to-1 student-to-faculty ratio. The school administers a portfolio of accelerated hybrid and fully online degrees that provide nontraditional learners with ample learning flexibility. The school’s 36-credit master of organizational leadership offers a fully online or hybrid format. Students who choose the blended option complete some courses on campus in Chicago or at a satellite campus at the University Center of Lake County in Grayslake. The degree features an industry-driven curriculum that teaches students to make effective decisions and build relationships within corporate, nonprofit, and government organizations. Learners take required courses in change leadership, team leadership, strategic planning and group facilitation, and nonprofit management theory and application. Participants use elective credits to enhance their degree by earning one of 16 business certificates in subjects such as finance and nonprofit management. Faculty deliver the program using seven-week courses, and most students graduate in under three years. Learners pay the same tuition, regardless of where they live. Additionally, the school allows graduates of the master’s in organizational leadership online program to return to the school to complete any future business courses or a degree with a 50% tuition discount. Admission typically requires a minimum 3.0 GPA, although students with lower GPAs may gain admittance if they submit their GRE or GMAT scores. The program offers multiple start dates throughout the year. North Park University is regionally accredited by the Higher Learning Commission (HLC). Point Loma, a private, Nazarene-affiliated institution based in San Diego, California, offers 12 graduate-level online programs, including an MA in organizational leadership. Organizational leadership learners typically earn their degree in 15 months, either fully online or through a hybrid program. Either way, students complete the program with a cohort. Those who pursue the hybrid option attend an in-person class one night per week, completing the remainder of their coursework online. They meet the same night each week for the program’s duration. At the end of the program, students compile a portfolio of course materials and current research related to their areas of interest. Applicants must hold a bachelor’s degree from an accredited college or university. They need at least a 3.0 GPA, but those with lower GPAs should speak with an enrollment counselor about PLNU’s exceptions policy. Prospective students must also submit a personal statement describing their leadership philosophy, relevant academic and professional experience, and career aspirations. PLNU is regionally accredited by the WASC Senior College and University Commission (WSCUC). Founded in 1969, the public research institution Indiana University-Purdue University Indianapolis now offers degrees from both Indiana University and Purdue University. The school offers over 350 academic programs, including 120 online options across the certificate, associate, bachelor’s, master’s, and doctoral levels. IUPUI’s School of Engineering and Technology offers an online MS in technology with an organizational leadership concentration. The program explores organizational leadership through the lens of technology, and it prepares students for roles as project managers, technical consultants, and production control managers. MS in technology learners pursue either a courses-only option or a directed project track. Students who opt for the directed project complete an in-depth investigation of a technology problem under the supervision of a faculty member and an advisory committee. Learners who choose the courses-only option take an extra class. Applicants need a bachelor’s degree in technology, engineering, or a related field. They need to attend an accredited university and earn at least a 3.0 undergraduate GPA. Prospective students should also submit GRE scores, three letters of recommendation, a statement of purpose, and a resume. IUPUI is regionally accredited by the Higher Learning Commission (HLC). Organizational leadership involves operational oversight in a company with the goal of promoting growth and development consistent with the overall corporate vision. It requires a person-centered approach that acknowledges the needs of groups and individuals. An organizational leadership master’s degree uses an interdisciplinary approach to prepare students for careers as organizational leaders. Whether a student hopes to lead a small local business in cornering the regional market or a multinational corporation, an organizational leadership master’s degree equips them with the necessary expertise to do so. Using a macro perspective that emphasizes administrative theories, practices, and analytics, an MBA takes an analytical approach to the study of business administration. By contrast, a master’s degree in organizational leadership incorporates a more person-centered approach, training students to work with individuals and teams to direct change and development. Those interested in an MBA should visit our 50 Best Online MBA Programs ranking. During an online master’s in organizational leadership, professors administer courses through the institution’s chosen online platform, such as Blackboard or Canvas. Before beginning classes, students may participate in an orientation that demonstrates how to watch lectures, submit assignments, complete group assignments, and stay on track with the syllabus. Students connect with peers over email, group chats, announcements, and discussion boards. Synchronous courses follow a set schedule, enabling students to ask questions and get answers in real time. Asynchronous formats provide 24/7 accessibility, allowing learners to complete a master’s in organizational leadership degree at their own pace. Successful organizational leaders possess self-awareness, an understanding of various leadership styles, and how to get the best out of their employees. Earning a master’s in organizational leadership degree provides career advancement opportunities. Bachelor’s degree holders enjoy entry-level roles, while professionals with a master’s degree qualify for senior-level roles, higher salaries, and more responsibility -- such as director or manager. Graduates with a master’s in organizational leadership enjoy career opportunities in human resources, public service, nonprofits, strategic leadership, and healthcare management. Organizational leaders track the return on investment of human capital in an agency, corporation, or department. They communicate clear expectations for team members, perform negotiations, and delegate tasks. The following positions are common among graduates with a master’s degree in organizational leadership. Senior Project Manager: Overseeing project implementation, senior managers monitor workflows from planning to delivery. They foresee potential challenges and solve problems to stay on track with deadlines. This role necessitates strong communication skills, managerial experience, and advanced knowledge of industry-specific technological programs. Consultant - Learning and Development: This outsourced role facilitates customized strategies and initiatives for corporate and agency clients to boost morale, introduce new policies and procedures, host seminars, and run workshops. Director of Operations: Directors of operations oversee the daily activities of businesses and organizations. They also guide institutional research and development. They may report to the senior vice president of operations or the chief operating officer. Chief Human Resources Officer: These professionals set compensation guidelines, grant performance bonuses, and facilitate benefits. They recruit new talent while training, developing, and retaining current employees. They also ensure that the company complies with labor laws and employment standards. Executive Director: Comparable to a for-profit CEO, an executive director oversees nonprofit organizations. While guiding the institutional mission, they oversee fundraising, budgeting, programming, and community outreach, answering to a board of directors. Important factors to consider when choosing an online organizational leadership graduate program include tuition, program length, transfer policies, and graduation requirements. Program Cost: In-state students typically pay less than out-of-state students, though some online programs offer the same tuition to online students regardless of residency. Additionally, public schools often offer lower tuition than private schools; however, many private schools offer more financial aid opportunities to offset tuition costs. Transfer Policies: Transfer policies vary by institution. Many regionally accredited schools only accept transfer credits from other regionally accredited schools. In addition to credit for prior coursework, some programs may grant transfer credit for work experience. Check with each prospective school to determine its transfer policy. School Size and Type: Small schools typically feature similarly small class sizes that afford students ample one-on-one attention from professors. Larger schools may consist of larger classes, but they may also offer more degree and specialization options than smaller schools. Program Length: A master’s in organizational leadership typically takes 2-3 years to complete, with full-time students graduating faster than part-time students. Some schools offer accelerated programs that allow students to graduate in less than two years. On-Campus Requirements: Consider whether a school offers the program fully online or in hybrid format. Hybrid structures combine online courses with on-campus requirements, so students should ensure that they can meet all on-campus requirements. In fully online programs, students can graduate without visiting campus. Thesis, Fellowship, and Work Requirements: Online master’s in organizational leadership programs typically do not mandate a thesis. Students may complete an advanced research project or internship to demonstrate mastery of the curriculum. Many organizational leadership programs prefer applicants with work experience. Accreditation is a voluntary review process that schools undergo to indicate that they meet high academic standards. Schools may receive regional or national accreditation, with regional accreditation typically considered the more prestigious of the two. The Council for Higher Education Accreditation and the U.S. Department of Education recognize accrediting bodies and list accredited schools that students can review. An accredited degree expands employment, financial aid, and education opportunities. How Long Does It Take to Get a Master’s Degree in Organizational Leadership? Depending on part-time or full-time enrollment status and credit transfers, students typically complete an online master’s in organizational leadership in 2-3 years. This course reviews individual and group behaviors in an organizational setting. Students learn how to steer departmental visions, allocate resources, meet stakeholder deadlines, and assess goal achievement. This course reviews the complex issues and challenges faced by team leaders. Students learn how to delegate tasks, manage expectations, and cultivate community. They also study ways to manage diverse and conflicting personalities. In this course, students study organizational governance principles and frameworks and ethical considerations for leaders. Students examine ethical dilemmas of leadership and their implications for strategy, growth, and decision-making. Courses on performance management cover the various types of performance appraisals and how they incentivize employees to increase profitability. Learners discuss subjects such as criteria, formats, common mistakes made by supervisors, and coaching guidance. Supervisors need to feel comfortable neutralizing team conflicts. This course, usually taught as an elective, teaches students how leaders can foster teams and build consensus across generations, cultures, genders, ethnicities, and regions. Online master’s in organizational leadership students and graduates benefit from joining professional organizations. These groups provide continuing education, networking, certification, and employment opportunities. They may also offer financial aid opportunities and discounts on relevant resources. Society for Human Resources Management: The SHRM publishes HR Today, the leading journal for human resource professionals. The website posts policy news, research, surveys, and labor market and economic data. The society also provides a database of job descriptions for HR managers and administers certifications. Institute for Management Consultants: IMC authorizes management consultants according to a strict code of ethics and professional requirements. The institute facilitates a database that connects members to corporate clients worldwide. It also provides conferences, webinars consultant chat rooms, and mentorship services. Center for Creative Leadership: The Center for Creative Leadership runs offices across the world for governments, nonprofits, and healthcare and pharmaceutical organizations. Its internationally recognized programs and certificates validate forward-thinking leaders. Members take advantage of innovative research, a career board, workshops, podcasts, and webinars. Institute of Certified Professional Managers: This organization governs management professionals worldwide. They grant certifications to managers and supervisors with significant work experience while providing financial aid through scholarships and awards. Members enjoy access to live online training. National Association of Sales Professionals: The NASP offers sales professionals two certifications: certified professional sales person and certified personal sales leader. Members benefit from online programs, virtual coaching, webinars, discussion boards for women, and free career coaching.